After the war, riders craved their still-familiar comforts like bicycling while also seeking to distance themselves from the viciousness of 1914-1918. Four years into her venture, “Mrs. H” issued the Holdsworth company’s inaugural catalog, “Aids to Happy Cycling,” right from her home in Kent. Definitive Holdsworth historian Norman Kilgariff recounts how the then-free distribution extended beyond cycling apparel into componentry. The 1930 edition shows a small selection of tires, brakes and pedals accompanying the more traditional company offerings of clothing, saddlebags and camping items. These items were available for purchase at four different locations in the London metropolitan area. Popular telling of the Holdsworth story picks up around 1927 when William Frank “Sandy” Holdsworth — husband of Margaret — assumes ownership of a bicycle shop in London, named Ashlone Cycle Works. Some few years into this expanded venture the company grows its offerings to include house-made and branded bicycle frames. 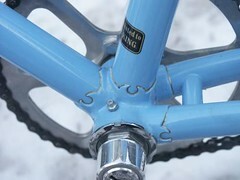 Constructed using traditional coal and bellows methods, the frames were an instant hit among satisfied everyday riders. By 1934 the Holdsworth catalog included seven single and two tandem models. Names like Cyclone and Stelvio were introduced to the cycling lexicon, as were Hurricane and Typhoon. While club riders failed to connect with the brands’ products, the masses kept buying them up. This populist momentum carried into World War Two, helped by a diversified product line and hard work at the factory. The post-War years were among Holdsworth’s finest. Quality was high and sales brisk as competitive wage structures and gasoline rationing continued holding back the impending onslaught of fossil fueled alternatives. FH Grubb Ltd., one of Holdsworth’s closest competitors, shut down operations in 1951. 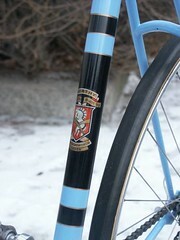 Holdsworth quickly absorbed the marque and its assets, reissuing its bikes as newly-branded Freddie Grub models until 1978. Claud Butler, another of Holdsworth’s closest competitors, shut down in 1956 and was sold the following year at auction. One year later, Holdsworth purchased three Claud Butler trademarks of significance. These helped feed an otherwise lean company while persevering through another period of energy-induced national economic crisis. The passing of Sandy Holdsworth in 1961 and Margaret in 1964 brought changes to the company. Among the more noteworthy was signing several professional riders to a Holdsworth cycling team over the next few seasons. 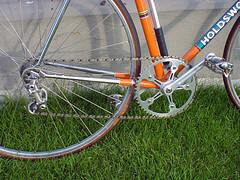 By 1969 the prestigious Holdsworth-Campagnolo team had formed and the brands’ association was fully leveraged to move product. 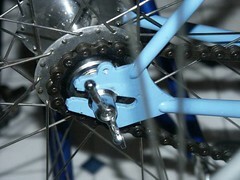 The 1970s ushered in refound emphasis on racing bicycles. 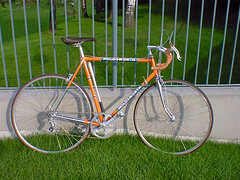 For Holdsworth this dovetailed nicely with a bike boom early that same decade in the United States, already a popular export destination for the company’s bicycles. While U.S. bike enthusiasts celebrated the bicentennial anniversary of their country’s revolt against British colonial rule, their industrious forebears at Holdsworth were fast at work producing a rounded line of quality two-wheeled product. And just like that, it was over. What took half a century to build was liquidated without fanfare in 1975. Attempts at rekindling the brand gyrated through several progressions, further fragmenting the name and diffusing its relevance to the marketplace. Note the sales material’s emphasis on the company’s innovative roots. If only they took this heritage to heart and treated the marketplace with its results. Margaret, Sandy and their contemporaries practically left the road map. Sometimes a tiny look backward is all it takes to make a giant step forward. Great website. I recently obtained a 1960 Legnano Gran Premio, so I appreciate your write up of this marque! I can reinforce the comments about Holdsworth’s ‘just-postwar’ quality having five minutes ago returned from 25 miles on my 1951 Holdsworth Cyclone. I also own an Ephgrave, three Hetchins and three Claud Butlers and the only bike that matches and possibly exceeds it in general rideability is my Gillott (1952). 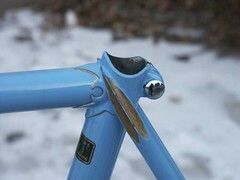 Surely the early 1950s were the golden era of lightweight frame building. Totally with you on the reliability of Holdsworth. Mine still happily does 200 miles in to London and back every week. 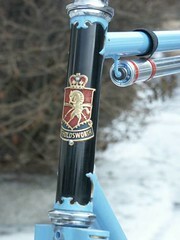 Does anybody know how I can ID a Holdsworth frame? I have what I think is an 1981 Elan but it has what look factory original horizontal track dropouts which I can’t find any mention of in the various online resources I’ve seen. Also there’s no sign that it’s ever had any cable guides, bottle cage mountings etc so I’m assuming it was built for the track. 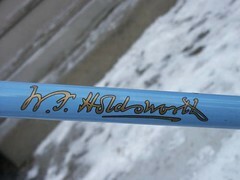 Josh, would be interested if you can help with ID of Holdsworth frame as i also have a Holdsworth Pro frame & forks that i would like to date, i think it is 1970.s but not sure. Hi Guys, I have an old Holdsworth frame given to me in the early 60s, but didn’t really ride it due to getting a motor bike. Many thanks for posting your message. It’s appreciated. Perhaps the resources available at the link above will help identify your Holdsworth.